Announcing the arrival of a new feature I am hosting on a page called Write Around the Corner...a roundup of compelling articles/features that are trending and timely. I'll link no no more than 5-10, and I'll do so every week or so. I hope you'll read, enjoy and weigh in! Early Childhood Education has received more attention of late, starting with President Obama’ Early Learning Initiative, which calls for availability of quality preschool for all, greater access to quality childcare through Early Head Start(EHS)/childcare partnerships, and expanded evidence-based voluntary home visiting. Another round of Race to the Top Early Leaning Challenge grants will continue to help awarded states build effective early childhood systems and increase quality and accountability of programs and outcomes. The fiscal year 2014 Omnibus Appropriations Bill indeed directs much-needed support toward federal early learning initiatives, particularly in light of last year’s devastating sequester, which cut programs and resulted in thousands of lost jobs and many more thousands of young children being jettisoned from their places of care. Hopefully the support for early childhood reflected in the 2014 budget presages a long-term commitment, given the critical need to invest in children’s most formative years. I Believe That Children are The Future. Oy. Never has there been a more obvious mantra, but despite the aforementioned good funding news, it is rather remarkable how little has been understood and acted upon regarding something so conspicuous—funding levels have ebbed and flowed, subject to budgets and political machinations, crushing reductions have occurred, and the resources have on balance, lagged behind the need. Of course children are the future. But what are we going to do abou it, particularly in light of growing evidence that that the future is now? We should see it, but for all too long, we haven't, and that's a mistake. A critical one. Because it matters. It matters a lot. And let's go ahead and put aside our personal biases about who should be educating children and where children SHOULD be, and deal with the reality of where children ARE. They are many places: at home, in child care, with grandma, at a neighbor's. Statistics reveal that in most U.S. families, all of the adults work. Fewer than one-in-three children today have a full-time, stay-at-home parent. Because of this, the majority of kids under five years receive child care from someone other than a parent. Almost one-quarter of children under five are in some sort of organized child care setting, which including nurseries, preschools and daycares, though some manner of family child care remains the common arrangement. But the cost of care is prohibitive for all too many families. The annual cost of child care for an infant in a child care center is higher than a year’s tuition at the average four-year public college in most states. Low-income families spend a much larger portion of income on child care: The average monthly income for a family making less than $1,500 per month was $938 in 2010—49.5 % of which was spent on child care(as compared with 8.6 % for families earning more than $4,500 per month). We exhort folks to join the workforce, but will we ensure they have quality, affordable care for their children to support their ability to remain gainfully employed? The bottom line: We must support families’ ability to find affordable, accessible, quality care for their children. Is there an ethical imperative? I say, yes. But I also recognize the folly in imposing one’s ethical beliefs onto others. Besides, reasonable folks can disagree. And though there are surely some Grinches out there, I try to presume positive intent and believe that everyone involved in the discourse cares about children and families. This is not a morality play. But it is stone cold serious. Let’s consider a few more reasons why. Studies reveal that by the age of 3, a baby's brain has reached almost 90 percent of its adult size, developing nearly 1,000 neural synapses per second. This firestorm of neurological growth and activity is critically dependent on appropriate and consistent stimulation which provides the foundation for learning. Vocabulary skills at 3 years old predict how well a child will read: research has shown that because professional parents speak so much more to their children, the children hear 30 million more words by age 3 than children from low-income households. It has also been demonstrated that vocabulary skills at 3 years accurately predict how well a child will read, which in turn correlates with future educational success or struggle--88% of kids with difficulty reading at the end of first grade have similar difficulties at the conclusion of fourth grade and 75% of students who read poorly in fourth grade remain poor readers in high school. The challenges and disadvantages faced by these children only compounds from there. What about the role of the family? , critics may ask. A fair inquiry; and the quality early learning interventions embrace and address family engagement, and the belief that a child’s parents, or whatever their family unit, are the first and most important educators. It is not so much a matter of en loco parentis as socium parentis. The goal is to empower, support and involve parents in all aspects of their children’s education and care. The research is pervasive, but is it persuasive? Is the message getting through to funders and legislators in a way that resonates and compels action? Well, that depends—largely on the messenger, as it so happens. And while it is essential that early childhood educators, leaders and advocates continue to lead the way, we must nevertheless contend with the “chorus effect”—wherein no matter how much we believe the same message from the same people ought reinforce said message all the more, it is instead diminished or even tuned out, because it is the same message from the same people. Everyone expects early childhood advocates to advocate for early childhood. But do they expect it from business, law enforcement, even the military? They soon will. Leaders from these and other sectors of society are recognizing, and witnessing first-hand, the critical role early learning plays in every sector—economic, educational, criminal justice, and yes, even military. On February 18, 2014, two national initiatives designed to rally business leaders behind the notion of improving the economy through investments in early learning, joined forces. Ready Nation, previously existing under the umbrella of America’s Promise Alliance, merged with America’s Edge, a project of the Council for a Strong America. The combined initiative will operate under the Council for a Strong America umbrella as the largest of its kind in the country. Their focus will remain the identification, mobilization and support of business leaders behind the early childhood cause, with a specific call for leaders to educate and prevail upon policymakers at all levels to see the wisdom in investing in quality early learning. Remember the old EF Hutton commercials? Well, when business talks, legislators listen. At least they should. The correlation between early childhood and future productivity and economic impact is undeniable. As Executive Director of my state’s early childhood advisory council(the Missouri Coordinating Board for Early Childhood), we commissioned an America’s Edge report which revealed among other things that were the funding provided to enable all of Missouri’s youngest kids access to quality early care and education, that investment would generate $3.5 billion in new spending in the state. Other measures of Return on Investment (R.O.I.) are even more compelling: the venerated longitudinal Perry Preschool Project projected an R.O.I. of 16-1, 80% benefiting the general public. You can bet EF Hutton would do cartwheels for such a return. Critics may argue that we cannot afford to make these new investments in the current fiscal climate. But studies show that investing in preschool will pay for itself by increasing future tax revenues and decreasing future spending obligations. When one considers the evidence on every level, another glaring headline emerges: we cannot afford NOT to invest. It doesn’t end there. George Lombardi, Director of the Missouri Department of Corrections, is a tireless and eloquent early childhood champion. “Helping the youngest of children to establish an ethical, moral and educational foundation is critical in interdicting them from the criminal justice system later in life,” Lombardi says. Study after study support his claims, and law enforcement is not alone in their recognition of the inherent connection between early opportunities and future productivity: the military has taken note too--in a big way. Mission: Readiness, a nonpartisan national security organization of senior retired military leaders operating under the umbrella of the nonprofit Council for a Strong America, has as its principal mission the call for smart investments in America’s children. “As former Chairmen of the Joint Chiefs of Staff,” said founding members General Henry H. Shelton and the late General John M. Shalikashvili, “It’s clear to us that our military readiness could be put in jeopardy given the fact that nearly seventy-five percent of young Americans are unable to serve in uniform. We joined Mission: Readiness because we believe that investing in our children through early education is not a Republican issue or a Democratic issue. It’s a plain commons sense issue critical to our national security.” Shelton and Shalikashvili headline a compelling list of generals and other leaders putting their names behind the early childhood cause. The cadre of champions from an ever-widening breadth of society augers the best chance yet for early learning to secure the support so desperately needed. And needed it is: Following its stimulus-infused zenith in 2009, federal spending on early childhood dropped nearly $12 billion dollars through 2013. The fiscal year 2014 Omnibus Appropriations Bill restores most of the federal education funding that was dramatically cut in March 2013 during sequestration, including 86 percent of Title I funds for poor districts and 86 percent of special education funds. The bill also includes appropriations for Head Start of $8.6 billion, an increase of $1.025 billion over current funding levels, $500 million of which is to expand Early Head Start for children and families from before birth through age three(as positive as this in, bear in mind EHS currently only serves 3-4% of eligible families). And it comes too late for most of the estimated 57,000 children who lost access to Head Start due to last year’s cuts, and is only a good first step on the road to making up lost ground and supporting early learning over the long-haul. As Generals Shelton and Shalikashvili exhorted, this should not be a partisan issue. It would be Pollyannaish, however, to think it won’t be. Myriad factors contribute to any significant decision on policy and funding and there will always be push-back and debate and so we must be ready to do our part. But the public will is there, and it’s growing: A recent poll conducted by Public Opinion Strategies and Hart Research on behalf of First Five Years Fund found that 70% of Americans favored a plan to better provide low- and moderate-income 4-year-olds with access to high-quality preschool programs. *Note: Welcome to Ten Acts of Penance, a serialized work which shall be released through my blog in installments averaging 2-3/month. Each chapter will be archived separately, though the book will build toward a cohesive whole. For anyone joining midstream, each chapter will for the most part be able to stand on its own, but this intro and a link to the prologue will be provided with every release, as it will serve as a reference/launching point for any ensuing chapter. As with pretty much anything I present here, I welcome feedback and suggestions in the comments section, as they will prove very useful when I edit for a final draft of the completed book. It was as though a bit of consolation from God. To bestow such a thoroughly inhospitable morning with such tinges of beauty. For it was cold; brutally so. The first snow of the winter had fallen, but then the temperatures had done the same, precipitously so, bringing with them inhuman gusts of chilled air, and sculpting puffs of downy flakes into frozen, crystallized clumps. The roads were what worried Liam the most. Plows had cleared most of the snow--save for the thin sprinkling which had fallen in the hours since--but it was the frozen slick which lay beneath that posed the greatest danger. He did not wish his family to go out in these conditions, but Emma had already missed dance class the previous Saturday and she didn't want to miss again. "She really wants to go," his wife Moira said, offering her best attempt at a reassuring smile. "It's only a few miles." His wife and daughter bundled up and he went to the door with them and when he opened it the cold punched him like a frozen fist. His body tensed and quivered and his lungs frosted. But then he noticed the beauty. When the wind stopped it was like a perfect and still sea of white. 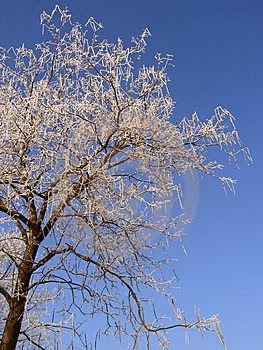 The tree branches were sheathed in frozen silver and as the wind whispered back to life the smaller branches swayed and clinked like a forest of chimes. He leaned down to kiss Emma but she had already bounded out the door, into the cold, darting across their snow-crusted lawn to the car. “Emma!” Moira called, following their daughter. “Wait. The car’s not unlocked yet.” Liam caught the screen door on its back-swing; it was frozen to the touch. He shuddered in the doorway as he watched Moira unlock the car and help Emma—who was so heavily layered that she required the assistance—into the back seat. He called back out to her but no sound came at first, so frozen had his lungs become. The car door slammed shut just as he found his voice. “I love you too!” Had she heard him? Moira scampered into the driver’s seat and he watched her turn the ignition with tremulous fingers. The car sputtered faithlessly to life, and Liam watched as Moira backed it out of the driveway. The tires spun and spit as she attempted to drive forward now, but finally they gained purchase and slowly rolled away. He stared out after them, into the unblinking whiteness, until the sound of wheels crunching over frozen snow grew fainter and could be heard no more. Emma loved the first snow of the season, always had. She would part the drapes of their large bay windows in the living room and stare out with big eyes as though their house had been plucked by a giant hand in the still of night and set down in some arctic paradise. Best of all was if school had been canceled, because she got to stay in her pajamas as late as she wanted, have hot chocolate and a big breakfast, then bundle up and venture out into the powdery wonderland. She savored those first few steps outside, because everything was hushed and beautiful and the snow was new and undisturbed, save for fleeting, tiny tracks from intrepid animals and together they would try to figure which tracks were which. “It’s perfect, Daddy,” she would say, and he could only nod and squeeze her small, mittened hand, because, he knew, it was. Their neighbor Pete, a small, graying widower, would usually be out shoveling his driveway and Liam would grab a shovel and help him. Emma would grab her sled and hoof through the snow across Pete’s yard and he would see her coming and withdraw from his coat pocket a jangling ring of keys. “Come along, then,” he’d say, and she would follow him around to his back yard, where neighbor kids loved to come when it snowed because he had the very best hill. It was long, deep and sloped down to a surprisingly vast meadow. In the spring and summer the meadow filled with flowers and birds and the kids loved to come to his yard in those months too, so they could scamper down the great hill and run and laugh in the meadow. Once Moira and Emma had worn matching sundresses and come to the meadow to run and dance and Liam had snapped a photo of them at the most perfect moment, as the fading light of sunset washed over them, and they were more perfect than angels. But so many people had taken to cutting through Pete’s yard that some time ago he’d erected a fence, which he kept locked, only opening it for those whom he wished to let through. Children always were permitted, but Pete was far less indulgent with adults. He would hold court in a rickety-looking wooden chair and sometimes joked with the children, asking them to identify themselves by their full and formal names, last name first, followed by first then middle. Knightly, Emma Rose, delighted in doing so and her giggles could be heard long after the door had swung open and she’d gamboled past. Liam looked out now at the tracks Emma had made in her jaunt across the lawn. He worried again that she hadn’t heard him and this worry became heavy within him, like an anchor. He released his grip on the screen door, and it swung back and clanked loudly against the frame and he expected for a moment that it would shatter like ice. He pushed the front door shut and stood for a while, inert, too cold to think or move. When at last he thawed into locomotion, he trudged in his stocking feet into the kitchen, poured some coffee and shuffled into the living room, where he sunk into the easy chair across from the mantle. He sipped his coffee and it warmed him and he gazed at the photos atop the mantle. Mostly pictures of Emma, and most of the rest of all three of them. His life, all that mattered, in frames. Moira had insisted on keeping his citation for valor on the mantle too, which he appreciated but was always a bit embarrassed about. Valor and vanity did not make good bedfellows. Not that he wasn’t proud of his calling and his service. He was a 21-year veteran of the force—having joined when he was 21, in fact-- and had given his all to his duty and had the respect of his peers. “Liam Knightly is, quite simply, the finest detective we’ve ever had,” Captain Kowalski had proclaimed at the ceremony where he’d received his citation. Again he’d been simultaneously humbled yet abashed—every other honest man and woman who walked a beat or served their community were every bit as deserving of accolade as he. But his parents would have been proud, and he’d wished they could have been there. They’d reminded him more than once through the years that his given name carried with it a meaning and purpose, and that his chosen field was anything but circumstantial. And so he appreciated the award and the words of his captain but knew to whatever degree each might be warranted, such estimation did not owe to being the very smartest or very toughest cop around, for he was neither of these things. He was pretty smart, observant, read and understood people well. But there were a dozen people on the squad whose IQs easily eclipsed his. He was reasonably tough, but not someone who would strike fear in your heart were you to see him coming towards you in an alley. Not like Sergeant Moberly, the 310-pound ex-pugilist whose square, battered features left little mystery as to his former vocation. And not even like Detective Mallory, one of two females walking the beat and who’d bested every single man on the force in arm-wrestling, save for Moberly, of course. No he wasn’t the toughest but he was as tough as was required, and he did not desire to be any more so than that. He kept his gun locked in a safe on the highest shelf of his and Moira's bedroom closet; he’d known of too many tragedies of children getting a hold of their parents’ guns. He wasn’t the smartest or toughest but had he been inclined to accept any measure of felicitation it would have been that he was if nothing else, dogged. Relentless. A keeper of his bond. The word “unsolved” and the notion of a “cold case” were anathema to him, for they were freighted with unpalatable connotations of injustice. For 21 years he had seen every case through to the often bitter end. He knew no other way. And so he was grateful for the commendation but thought to himself upon receiving it that it owed more than anything to his ability to have stayed alive as long as he had. He sipped more coffee and its warmth soothed him and he found himself drifting off so he placed the mug down on the stand adjacent the easy chair, beside the phone. Sleep came quickly. When the phone rang, he knew. He could not consciously fathom how a ring could sound different than any of the infinite number which had preceded it, but he’d had the terrible responsibility to place such calls on more occasions than he’d care to remember, and more than once the person on the receiving end had later shared that this was indeed the case. It was merely a ring, a sound—but it presaged the death of his world and so too of him and only now could he fathom it. From those terrible times when he’d borne the sad duty of placing the call or paying the visit, he’d also learned that those on the receiving end pray instantly to awaken, that their sudden nightmare be revealed to be just that. He’d seen their faces and watched whole pieces of them die when they could not awaken. And in this way his torment in this moment was different, worse, if only because his experience now denied him of those fleeting moments of denial. He staggered to the front door and threw it open and the frozen air lashed at him and he felt nothing but stared out at the yard. He could hear the sirens and they sounded close, less than a mile off, and the bile churned in his stomach and he doubled over where he stood and was sick. He could still see the prints Emma had left as she’d crossed through the first snow of the season on the way to the car. They trailed away and were filling with more snow and would soon be gone. What consolation he had somehow ascribed to God not one hour ago, he could not recall. He cursed God now, then went to the mantle and grabbed the picture of his wife and daughter in their sundresses. He stumbled up the stairs to his and Moira’s bedroom, clutching the framed picture to his chest. It occurred to him that he should have dispatched of his citation, for what he was to do was the most cowardly of all acts. He went to the bedroom closet, and reached for the highest shelf. He was in the wrong place. He had awakened to a shimmering vision of golden light which was not of the world he had once known. It emanated from a panel of pearled gates, three to a side, in front of which stood a man. In one hand was clutched a ledger, inscribed with the most ancient of text; in the other was a reed, gleaming from the inside out with the same golden brilliance as the gates at which its owner presided. The man wore simple, white robes, and his hair and beard were thick and white as well. 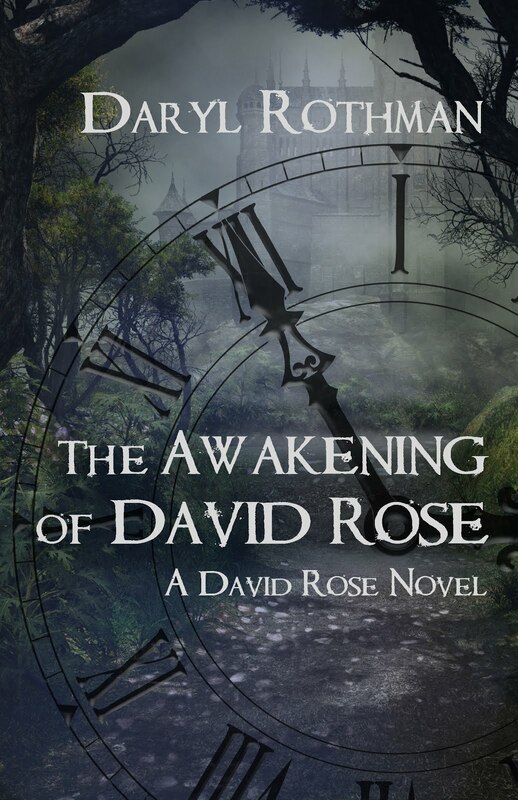 From a pocket within his robes protruded a ring of crossed keys—one gold, one silver. Liam stepped forward, toward the gates and toward the man, for he must tell him there had been the gravest of mistakes. But now he stopped. For now he could make out that there were others walking before him, a woman and a child—a girl. He called out but they did not turn; he ran toward them, but got no closer. Liam’s heart, which had died once on this day, froze. Liam watched as his wife and child moved on past the gates and now he was moving, closer at last, but as he neared the scene began to fade. The gates were reshaping, losing their brilliance, and the man in the robes was changing too. His hair darkened slightly from white into gray, his attire shifted and discolored, and now his possessions transformed as well: the golden reed dulled to a darker, mahogany hue, and the gold and silver cross of keys twisted and jangled into a key ring of more pedestrian variety. The gates were closing and Liam ran for them, for the woman and girl who stood beyond them, watching him, waving to him. It was too late. Again, too late. The gates closed and he could not see past them but he saw now that they were not of pearls but of wood, and their sentinel was one he knew. “Pete,” he said to the little, gray man, who sat in a rickety-looking wooden chair reading from a ledger. The man raised an index finger. He’d been right about that. Liam looked around him. All which he’d awakened to had transformed completely and he was, far as he could tell, back home, next door, in Pete’s backyard. Pete regarded him patiently. Liam stared at the keys. Pete stretched his back, nodded, and leaned on his cane. “Indeed. But so too for all who shared your calling. Few succeeded as you did. Look inside. What drove you?”Pete slowly raised his cane and touched the tip of it to Liam’s heart. It suddenly blazed alive with the same golden incandescence as had the reed. Liam closed his eyes as vivid memories along with every emotion he’d experienced with each case flooded over him. Mystery, resolution, joy, pain. Liam looked at the closed wooden gates, wishing he could see beyond. A big THANK YOU to everyone who has participated in my website launch this weekend by subscribing and/or visiting the site. I also wanted to acknowledge my dear friend Tammy, who pretty much constructed the entire site and without whom none of this would be possible. She added some nice touches just today, which have met with good feedback--check it out when you get a sec, they are some nice aesthetic and structural enhancements. Coming soon, the first chapter in my serialized thriller, Ten Acts of Penance, my first blog on the critical importance of investing in early childhood, and announcement of some terrific guest interviews. Stay tuned, and thanks again! I arrived at a key juncture in one of my books recently, and as I endeavored to craft the scenes with precision, I found I had so many dam questions. Really. Dam questions: in my story, a fictional 1970's Midwest town diverts its main river, erects a dam and permits the town to be flooded. And while the story is not really about the dam—it is about some of the dark secrets about to be submerged along with the town—the building of the dam is still a pretty integral piece of the action, and I wanted to write it effectively. But what would constitute that? I recently threw this question around with a writer friend of mine. What comprises good detail and description? What is enough, what is insufficient, what is superfluous? I don’t think there’s an easy, formulaic answer. I visualize every scene I write as if it will be onscreen and I’d like the reader to be able to do the same. And it’s a bit difficult to predict how much or how little readers may know about dams, or how much or how little they’ll care. But I do have a little more say on how important all this is to my characters, and my sense of this should guide the amount and type of detail I subsequently provide. In the scene in question, the construction magnate overseeing the project takes pride in immersing himself in every step of every project which bears his name, and so when it came time to write about the dam’s construction, I felt it needed pretty strong detail, because the scene unfolds mainly through his point of view. Glossing over the process, or omitting key details or worse yet, botching some, could erode the credibility of that character, that scene and of the story itself. But again, the dam conundrum—I wanted readers distracted neither by too much detail, nor by insufficient or inaccurate information. And so a little dam research was in order. I found a pretty good website, the British Dam Society. It’s actually pretty cool, and I found there were some key steps typically involved in the construction of a dam: Diverting the river; Preparing the foundation for the dam; Building the dam; Filling the reservoir; Testing that valves and floodgates work; Monitoring the behaviour (British spelling) of the newly built dam. And if you choose to give the site a quick perusal you’ll see that each of these steps possesses its own steps and procedures, and that there are myriad other details that go into such an undertaking. So I extracted a decent chunk of information and plopped it onto my page, then set about incorporating it into the dialogue and contemplations of my construction magnate. I started with too much; I reasoned that I could always trim some of the dam vernacular if need be, but that it was essential that he sound conversant on the topic. Unsurprisingly, some pruning was necessary, but I am cautiously optimistic I navigated that careful balance between credibility and excess. I guess we’ll see. There is of course no shortage of literary advice on this topic (perhaps even excessive?). “When you step away from the ‘write what you know’ rule, research becomes inevitable,” Stephen King says in On Writing. “And it can add a lot to your story. Just don’t end up with the tail wagging the dog; remember that you are writing a novel, not a research paper. The story always comes first.” Indeed it does and if your story, your characters, your writing, are not strong, then successfully distinguishing between a concrete dam and embankment dam is unlikely to save you. Like with so many parts of the writing process, I rather suspect navigating that sometimes elusive balance comes best through practice, and perhaps with a little bit of trust. Trust your readers, trust your characters, and trust yourself. PS: I must confess here to the delight taken in sending an email to the British Dam Society, seeking some clarifying information. It was the first and probably only time in my life I was able to write “dam questions” in the subject line. I never heard back. Temporarily Unavailable: stay tuned for a Spring relaunch! "Writing is magic, as much the water of life as any other creative art. The water is free. So drink. Drink and be filled up." Here's a piece of short fiction I had fun writing. I hope you enjoy it. For more free samples of my work please visit "My Writing" page. "Vernacular?" 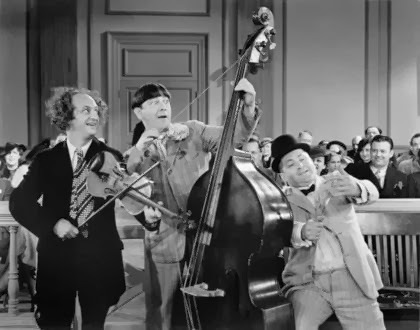 Curly protests, in this scene from arguably the Stooges' most venerated episode, "That's a Derby!" Ten Acts of Penance: Act One, Demon Witch of the Willamette. Chapter Four. Designed by Charm & Co.